Noticed how the Taiwanese seem to idolise everything French? You must have noticed the innumerable amounts of Eiffel Tower figurines, French style bakeries and Macaroons around Taipei by now. 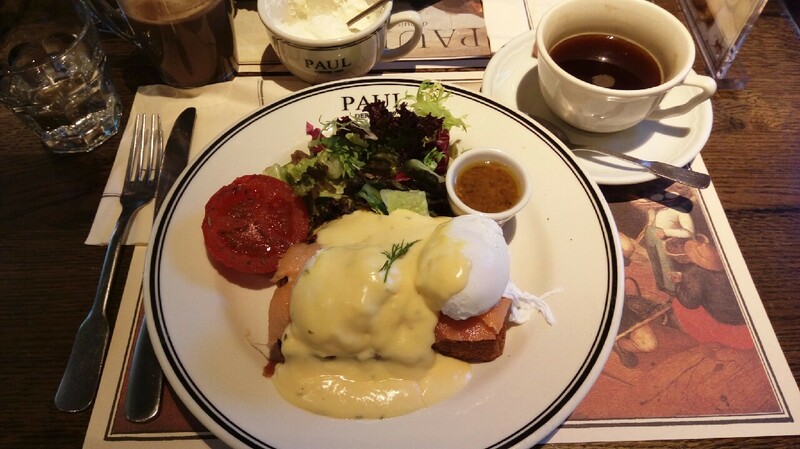 Going for breakfast is certainly worth doing every now and then, as the relaxed and comfortable feel of Paul at breakfast time is something that can be enjoyed whilst further enjoying your eggs. This isn’t going to be a long post or packed with pictures. I will be keeping this one short and sweet. I had the Eggs Benedict with Salmon ($320). This is one of my favourite breakfasts when I eat out at any western place. However, previously eating this at The Diner made me become a little more cautious (runny hollondaise sauce and poorly cooked eggs at the DunHua Branch a while back), so I tend to save my order for places I am sure will be able to pull it off to a high standard. Two beautifully cooked poached eggs with the yolk nicely runny, plenty of thick cut smoked salmon layered on top of nice crunchy toasted bread and accompanied by a fried tomato and a salad with vinaigrette dressing on the side. Washed down with a coffee, it well and truly hits the spot. 107 RenAi Road, Section 4, DaAn District, Taipei City.